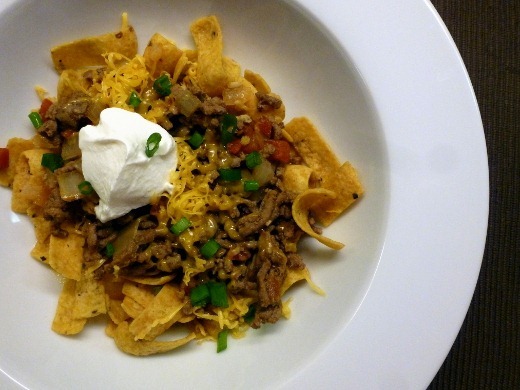 Poor “Chili Corn Chip Pie” has been kicked off my weekly menu so many times. Each week I plan out my dinners in advance, but often something will come up one or more nights of the week that causes me to have to change my plan. Often I’ll plan a “wing it” night into the mix to accommodate such happenings, but sometimes I don’t. In those cases, I end up having to “delay” a meal until the next week, since I typically will have all the ingredients on hand to make it. When that happens I have to pick a meal that has the least amount of perishable ingredients, and for several weeks now, this Corn Chip Pie has been floating from week to week, since easily-freezable ground beef is the only major perishable ingredient in the dish. Finally, finally, I made this, and it was a GOOD one! Can you believe the recipe is from Cooking Light? 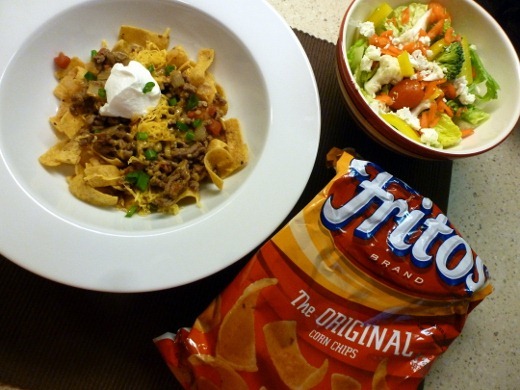 This recipe is Cooking Light’s play on the concession stand treat involving an opened bag of Fritos with a scoop of chili on top. Have you had this before? I haven’t, but I will tell you that I did have something similar to this in elementary school called “walking tacos” if my memory serves me correctly. 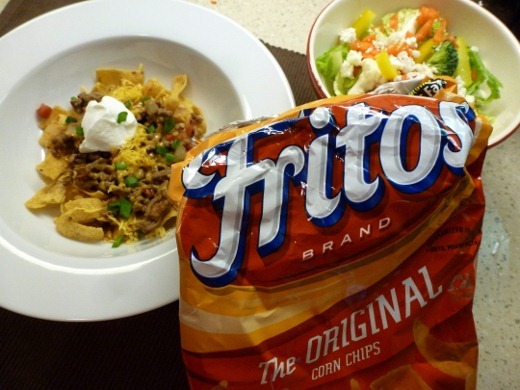 Basically, this was one of those $0.25 cent bags of Fritos with a cup of neon yellow cheese and another cup of taco meat on the side. Nutrition at it’s finest, kids. Maybe a scoop of canned corn if I were feeling like a particularly health-conscious fourth grader that day. Anyway, so this is like the concession stand treat, except this version uses of lean ground sirloin and only a modest portion of corn chips. Ladies, this one’s a man pleaser. 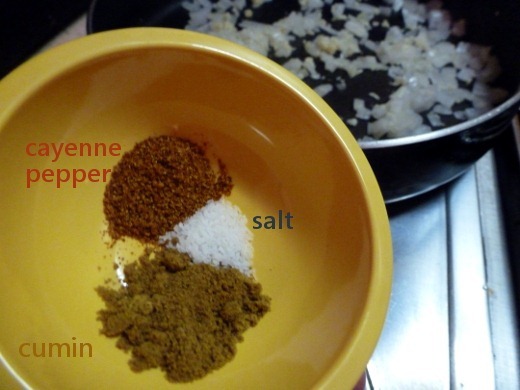 I knew the huz would like this recipe (he did!! ), and I picked it with him in mind. Just a leetle cheese and sour cream dollop, please. Yummy quick and easy dinner. Heat a large skillet over medium-high heat. Coat pan with cooking spray. 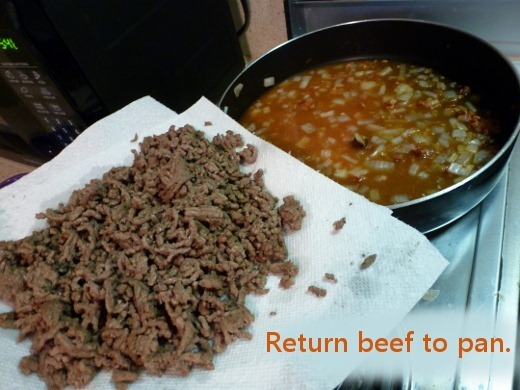 Add beef to pan; sauté 5 minutes, stirring to crumble. Remove beef; drain. Wipe pan clean with paper towels. Add onion to pan; sauté 4 minutes, stirring occasionally. 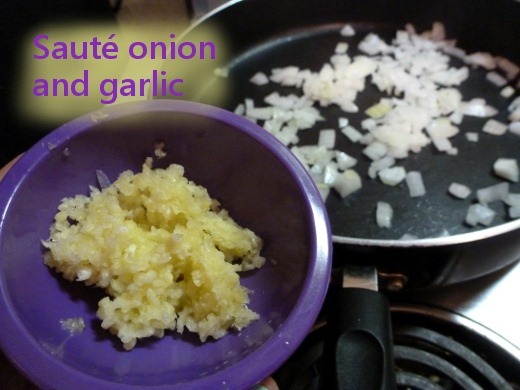 Add garlic; sauté 1 minute, stirring constantly. Stir in beef, cumin, pepper, and salt. 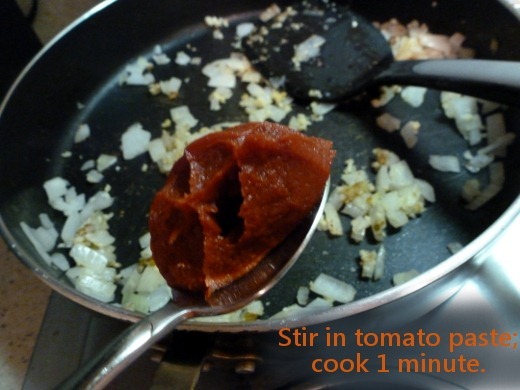 Stir in tomato paste; cook 1 minute, stirring occasionally. 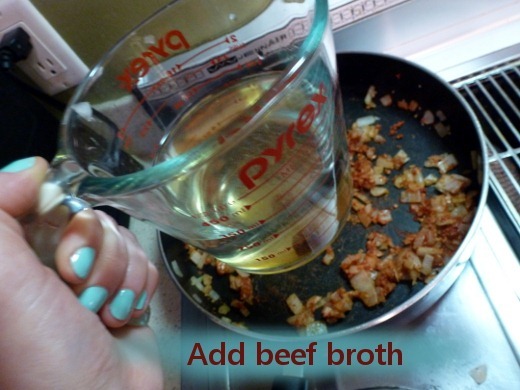 Add broth, 1/3 cup water, and tomatoes; bring to a boil. 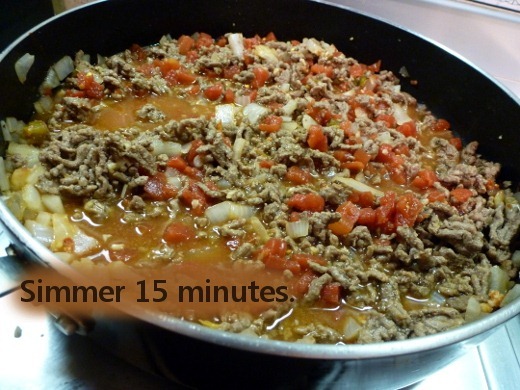 Reduce heat to medium, and simmer 15 minutes or until slightly thick, stirring occasionally. Remove from heat. In our house, it served two for dinner, and one for lunch the next day. 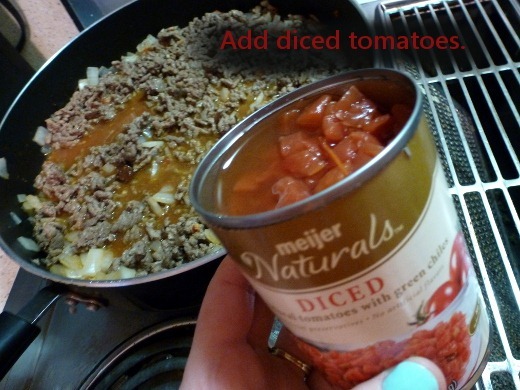 Pingback: Dinner Meal Plan for September 29-October 5 | Meg.Goes.Nom.Nom.